The query shown in the last post vectorised the raster in order to produce a very precise overlay and measure the are exactly. Raster points falling on the edge of the buffer would be split and only the part of the pixel falling inside is measured. If pixels are small in relation to the polygons this is overkill. The rasterisation method that was used in this post would be accurate enough. This should run much faster, after finding a good tile size. There is as yet no equivalent of ST_SummaryStatsAgg when the raster layer consists of classes. However, it is easy to extract counts of the number of pixels in each cover class, which is all that is needed. The vectorised version already calculates the percent cover while the rasterised version just returns a count of pixels. A more complex query could be built around this by further grouping, but the simplest solution is to send the results to R and sort it all out there. Another issue was apparent with this particular data set, that consisted of typical herbarium collections. There were multiple records of the same species at some sites. This can be fixed by running a select distinct query on the combination of site coordinates and species name. An even better solution would be to select only distinct sites. However this would then require indexing species to unique sites, which would make sense for a more formal database but is not needed for this exercise. 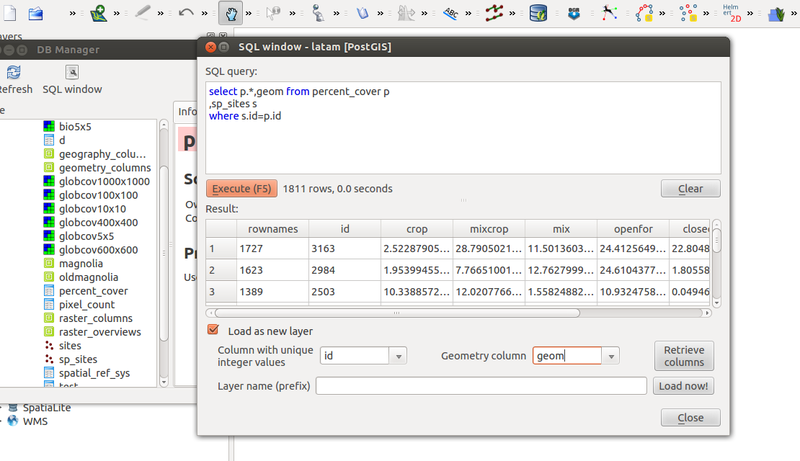 Now, the query for the whole data set can be run in a matter of minutes, rather than hours. After importing the results into R with ..
A quick check showed that the total pixel count for each unique Id varied between 4041 and 4051. So at this level of accuracy it is fine to divide by a single number for all (the median was 4043). So this processes the data into simplified classes for the region. Some of the less common land use classes are not included in order to keep things simple, but this can be changed if needed. Then just glue the table back in place in QuantumGIS and display it. I hope this is useful as a template for similar analyses. Once a general form has been found for a spatial query in PostGIS raster it is quite easy to see how to adapt the query to other situations. In this specific case it may be necessary to review the choice of key landclasses that are selected in R in order to simplify the output. 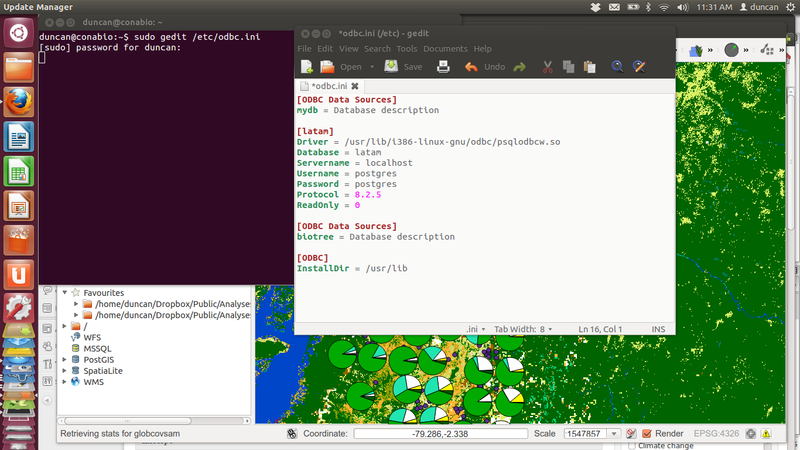 Linking R to PostGIS through RODBC is very useful, as a lot of data processing is simpler in R than in SQL. 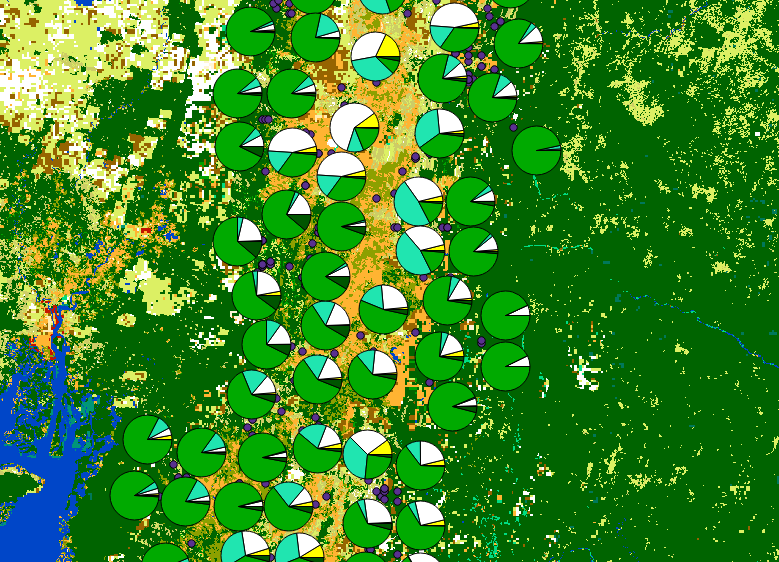 November 1, 2012 in POSTGIS, R scripts, Uncategorized.